This Japanese darning stitch is the tenth stitch on Sunday stitch school challenge by Queenie. The working of the stitch is on her blog. 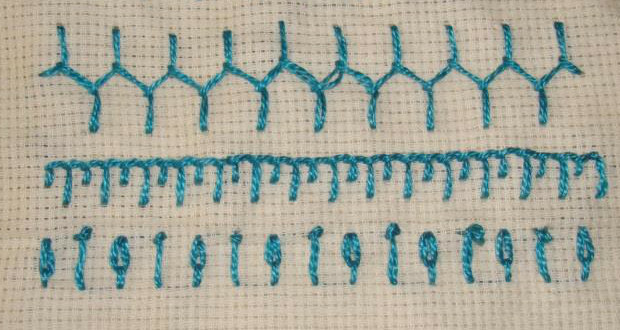 This is the first time I have seen or heard of this stitch. SSS challenge is a very good idea. So many new stitches to learn and explore. Started the sampler with the basic stitch. 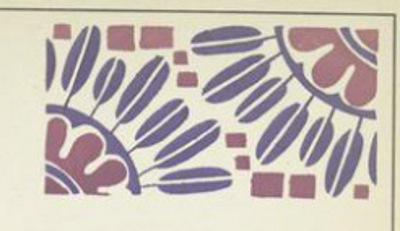 Queenie had worked this stitch in two colours to explain the working of the stitch. The treatment was tried in the second sample. 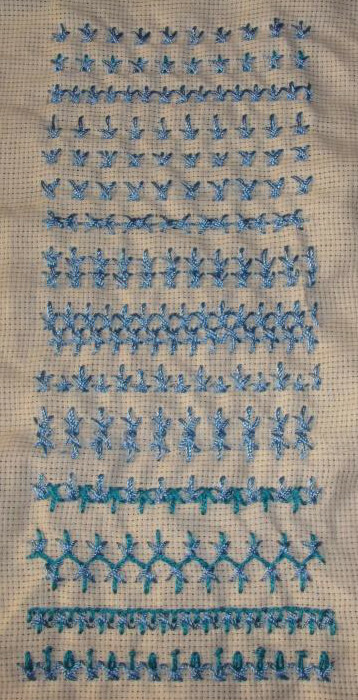 The samples in this part of the sampler are worked with two rows of running stitch instead of three. First is the simple version. In the second sample, the running [?] 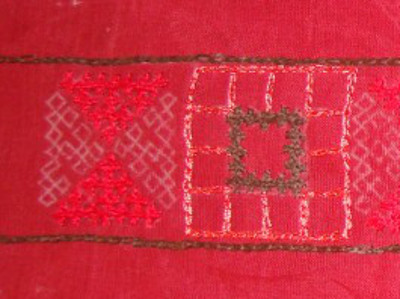 stitches on the second row are worked in different heights. In the third sample, after skipping every second stitch on the bottom row, the running stitches are worked short and long alternatively. It was easier to work this sample than to write about it. 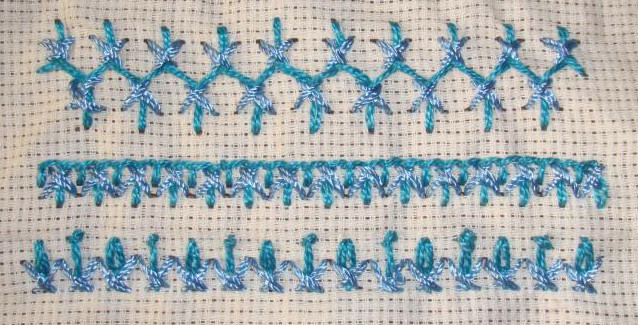 The Japanese darning stitch with three rows of running stitches sandwiched between the two rows of running stitch version in the first sample. The Japanese darning stitch is worked as filling stitch in the last two samples, last one is an attempt to work the stitch diagonally. The last two were worked in stranded cotton and the rest of the sampler was worked with polyester thread. Japanese darning stitch and its half version will lend themselves to lots of seam options. Browsing for this stitch led to Sashiko embroidery. That goes to To Do list. 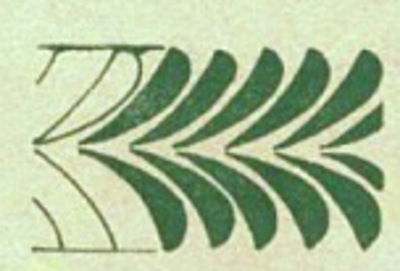 This stitch is used mostly to repair or embellish textiles. This challenge is giving an opportunity to open new doors in embroidery. This stitch is worked with two strands of perle cotton [I think] on queenie’s blog. Continuing with that- the first row is the basic ermine stitch. The straight stitch in the centre is worked with another thread in the second row. 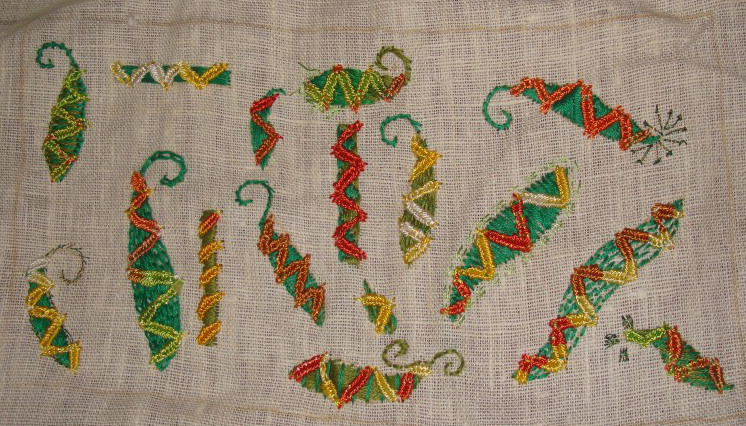 In the third row the individual stitches are worked continuously to make this a linear stitch. 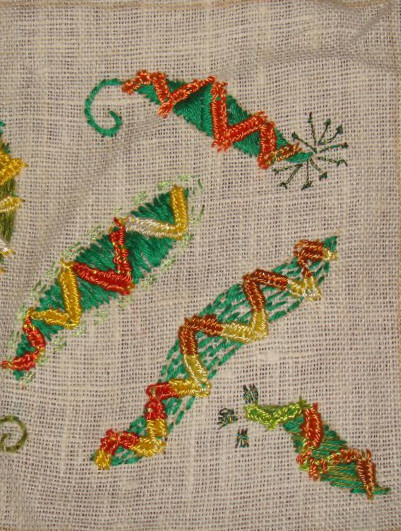 In these three rows the height of the three stitches are varied and explored. the ermine stitch and its mirror image are worked in a line in the first sample. A long straight stitch is made in the second row, and two ermine stitches are worked one below the other. The ermine stitches are worked in opposite directions in the third row. 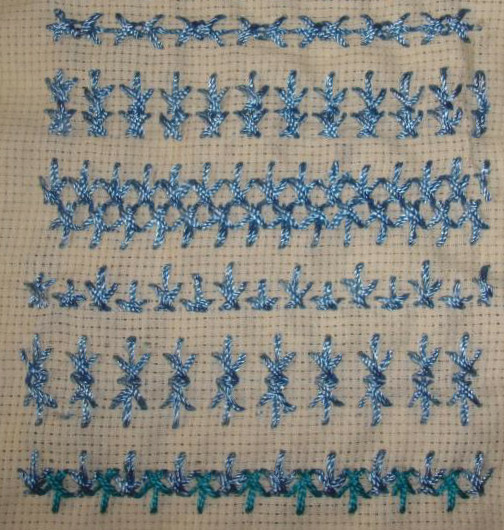 The fourth row is the long and short version of the ermine stitches worked alternatively and this row should have been in the second part of the sampler, the idea came later. Two ermine stitches worked in opposite directions in the fifth row. The ermine stitch and its opposite version in another thread is worked beside it. the same treatment is continued on the last row. 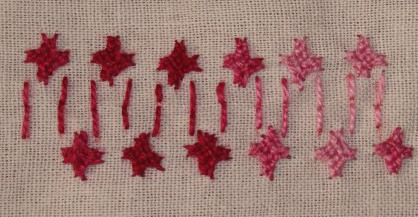 Cretan stitch in the first row, buttonhole variation in the second row, pistil and long tailed detached chain in the third row. I enjoyed working on this stitch sampler. The stitch gives room for many possibilities. Sometimes it can be used for filling wide spaces, creating shapes, securing long straight stitches, sometimes as a couching stitch too. After working on this stitch for some time, a rhythm is achieved, which can be used for working on plain fabric. The last set of samples of woven chain bars. 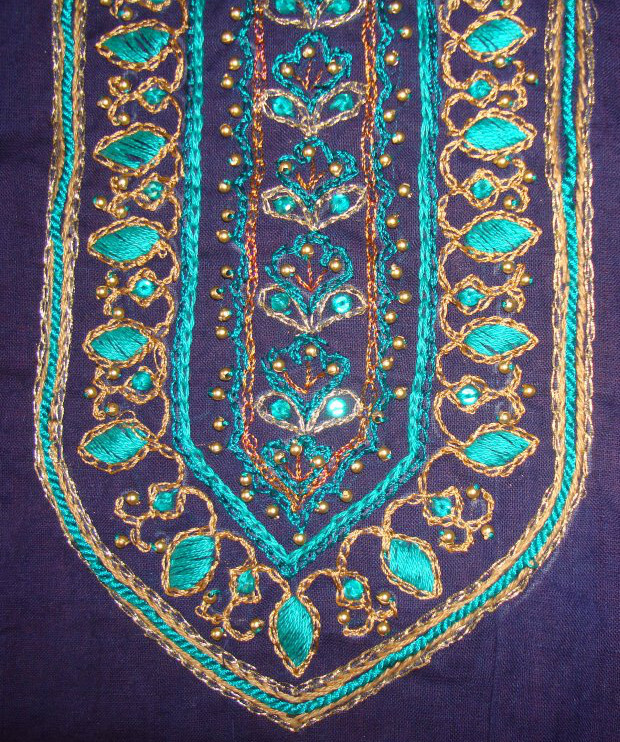 Colours are changed on alternate v- shapes in one paisley, one side of the chains are woven in different colour thread in running stitch filled paisley, pistil stitches and cretan circles are added to other two woven chain bars. There is lot of space between these paisleys. Sometime later they may be filled. With this stitch sampler TAST 2014 challenge is completed. I ammissing the challenge already. Till SharonB comes back to start this challenge, I am pondering on some ideas. Work on some lattice filling stitches available on the internet.